I have joined a wonderful new group on etsty, called, Metsy Team. It is full of awesome artists and has a wonderfully friendly, nurturing atmosphere. I am very thankful for the invite to join! One of the first things that I am doing in this group, is entering a color challenge. We are to use purple and green in this color challenge. While these are not my normal color palette, I do love them together so I set out to use them and still retain my “look ” and “feel” in this piece. 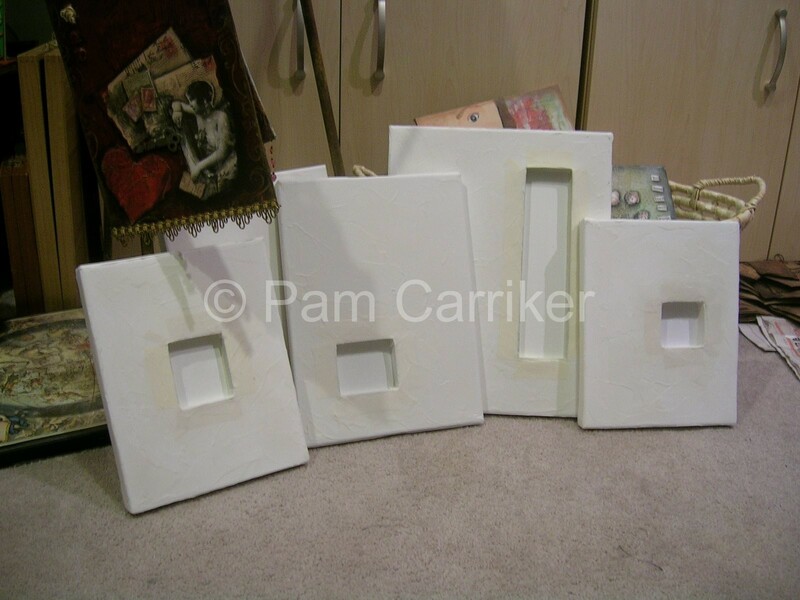 I started with an 8×10 canvas and cut a small rectangle out so that I could insert a small box. This created a small niche to put something in. I secured the box with tape and then used molding paste over the whole canvas. Here are some canvases ready to go. Next I layered washes of acrylic paints, leaving areas of underlying colors to show through. 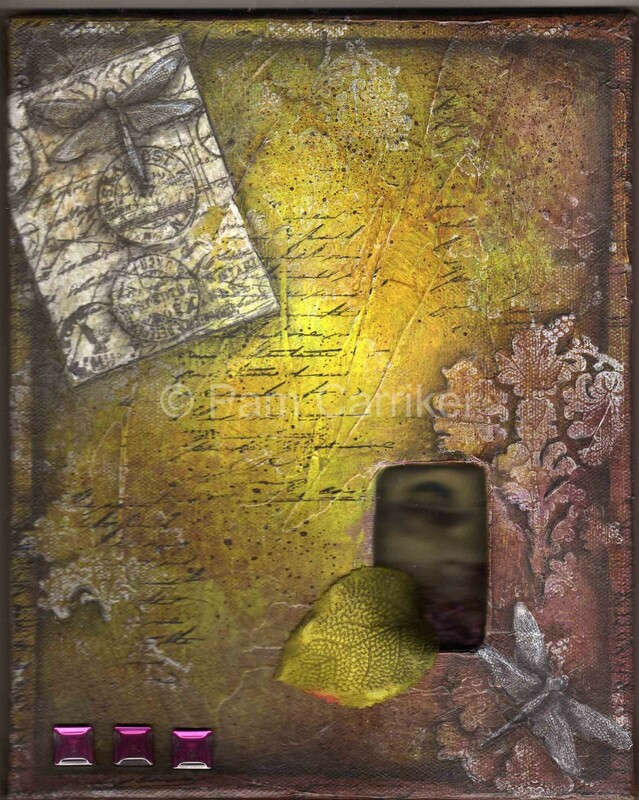 In between colors I also added stamped text, and other stamped patterns. 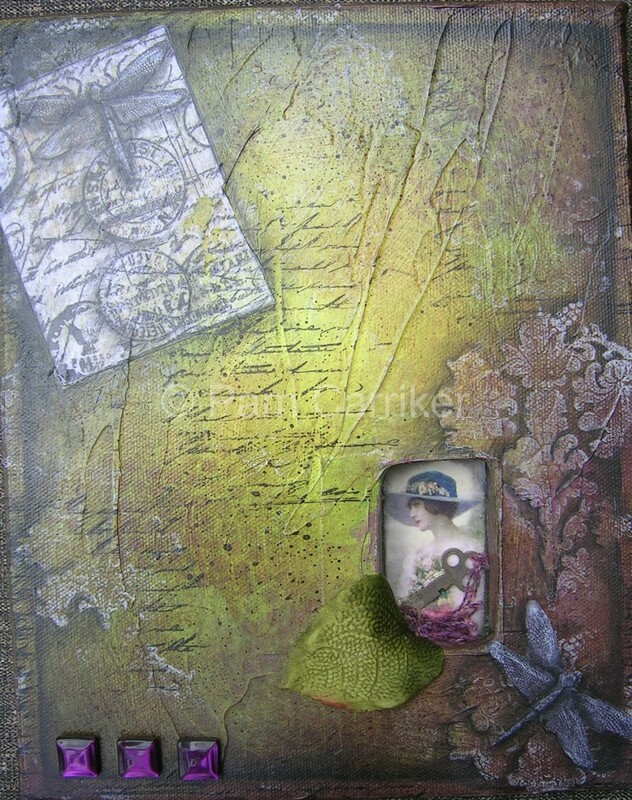 Then it was time to stamp a lovely new stamp onto some tissue paper and then adhere it to the canvas with gel medium. I added some shading with charcoal, and an image of a lavender hatted lady to my niche. An old key with some fibers attached, three purple, vintage buttons, and a velvety green leaf, finished off my little niche. I was very satisfied, when all was said and done, that I stepped out of my color box and still retained my style in this piece. What fun! This is a scan of the piece and it doesn’t show the lady too well, for better pictures, look in my etsy store. Ok, Blaiz dearie, here is the picture off of etsy which shows the Lavender Lady better:-) Your mouth to Cloth, Paper, Scissors ears! Thank all of you for the nice comments, you made my day! The picture on your blog doesn’t do this piece justice. I searched for it on etsy, and it’s gorrrrgeous! You should submit an idea to Cloth Paper Scissors to teach your charcoal technique because it’s amazing!